Because it’s hot outside, because it’s summer, and because it’s Monday, I have attempted to make a protein-packed, low-carb version of a Reese’s cup. I love chocolate. Apparently the internet world calls these “fat bombs”. They contain a lot of healthy fats that are good for you, help increase your metabolism, and burn sugar in your body. I’m not sure who invented “fat bomb”, but I’m going to call them delicious instead. 1. Combine PBfit powder, almond butter, cream cheese, and coconut oil in a stand mixer or blender, and blend for five minutes until everything is completely incorporated. 2. Line a muffin tin with mini muffin liners. 3. Scoop a tablespoon of peanut butter mixture into each muffin liner. 4. Place in freezer for ten minutes to firm up. 5. In a small bowl, combine cocoa powder and whipping cream, and microwave on high for one minute. 6. 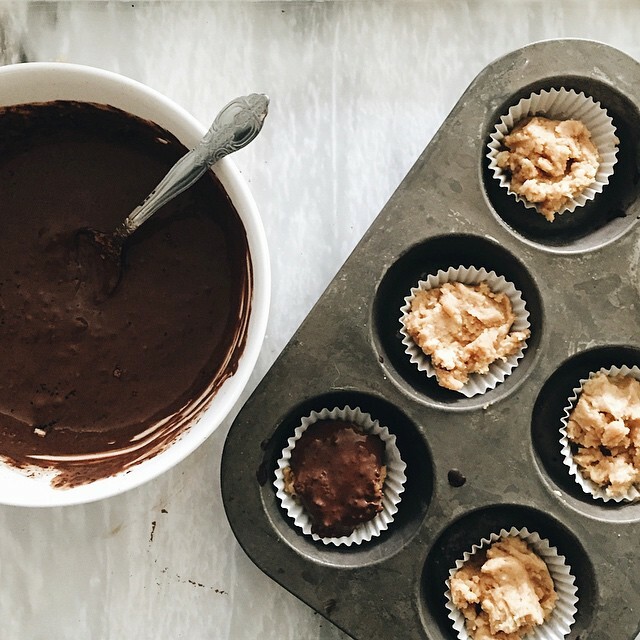 Stir until mixed together and spoon a teaspoon of the chocolate ganache onto each cup. 7. Freeze for up to 24 hours and enjoy.